31190 was running as 0Z47 from Tyseley to Washwood Heath. Yesterday it had brought a Class 47 from the NVR to Washwood Heath and was stabled at Tyseley overnight. I couldn’t get to see the locos yesterday but I’m pleased with the photos from today. This entry was posted in Sharpo's World Photo Updates on July 31, 2009 by Sharpo. On the way back from Bewdley we stopped off at Kidderminster, I was curious to see if 20059 had arrived. It was, and better still, in a place where I could get some photos from the nearby footpath. 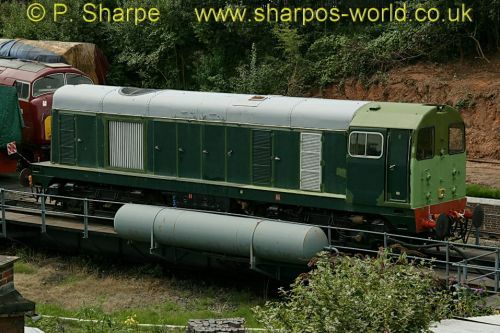 It is owned by the same group that own D8188/20188, which I believe has been a very useful loco over the last couple of years since arriving, and I look forward to seeing it running at sometime in the future. I’d tried for this train twice before here, first time I missed it because it had been re-timed to run earlier, second time it was running extremely late and I couldn’t wait. Today worked out well, even the sun was shining. It’s great to see the older locos still working, makes a change from Class 66s, they get rather monotonous. One photo here, great livery! This entry was posted in Sharpo's World Photo Updates on July 30, 2009 by Sharpo. Didn’t expect to see this, the only working of interest down the “Dark Side” this week. I only had one appointment during the week, for a physiotherapy session at the local hospital at 13.30 – which was just a few minutes before the train was due to arrive at Rowley Regis goods loop. It was booked to leave at 14.03 but would I get to the station before the train??? I even tried to alter the time of my appointment, but nothing else available this week. Fortunately I was out by 13.50 and reached the station just a couple of minutes before the train. Old Hill must be one of the worst stations for photography on a dull day, as there are so many trees blocking the light, if nothing else, a challenge! Still, at least I saw & photographed the train. This entry was posted in Sharpo's World Photo Updates on July 29, 2009 by Sharpo. The working I missed a couple of weeks ago! This time I was determined to see it, and after checking the train was actually running, headed down to Rugby to wait for it. I was at Rugby well before it was due, just in case it ran early again, and made the most of photographing a few other trains while I waited. Even managed to work out the headcodes and workings of the freights, pretty clever for me! It’s good to see the more unusual class of loco working trains, as the 66s become very monotonous after a while. The 86s and 90s were also a bonus. This entry was posted in Sharpo's World Photo Updates on July 28, 2009 by Sharpo. A ride on the train from Bewdley to Bridgnorth and return today. 7802 was our loco, 46443 & 4566 were the other locos working trains. 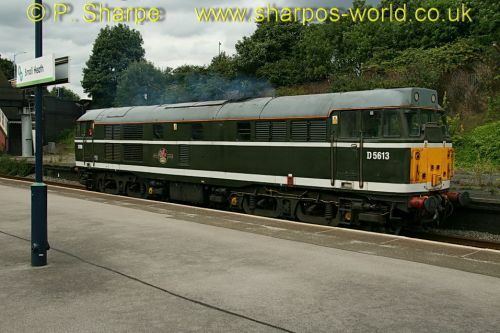 This entry was posted in Severn Valley Railway on July 28, 2009 by Sharpo. I like to see the older diesels that still operate on the main line, and today I managed to see Class 56/3 no 56312 passing through Rugby. Today it was “on time” unlike when I missed it a couple of weeks ago due to it running over 1 hour early. A few other freights were seen, so more photos for me to sort – but not tonight. This entry was posted in Main line on July 27, 2009 by Sharpo. I just happened to be in the right place at the right time. I was in the grounds of the castle, looking over the wall at the station below, when I heard some ‘planes in the distance. 5 ‘planes were approaching very fast, not realising what they were, it took me several seconds to get the camera ready but I managed a couple of shots. Thinking I wouldn’t see them again, it was good to see the vapour trails in the distance, then soon after more trails as they appeared to be “looping” in the distance. 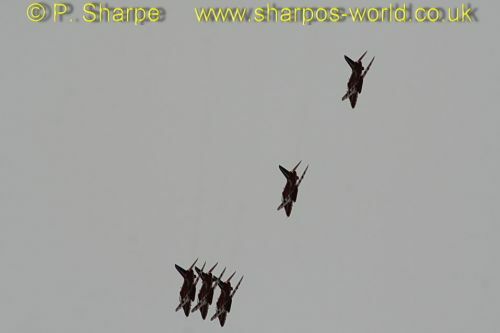 A couple more distance shots & then soon after 9 ‘planes flew overhead & the shots came out quite well. This entry was posted in Sharpo's World Photo Updates on July 27, 2009 by Sharpo. 31285 was working an Exeter to Derby test train. It was a loco I had not seen before, so suggested to Margaret that we take KC for a walk over Bromsgrove way. She knows there is always an ulterior motive to such suggestions & was not surprised when I explained a train was due “soon after 11am”. I stood on the bridge as “they” had a walk around the nearby field. Thunder sounded in the distance but the rain held off, they were soon back on the bridge with me. Other people walking dogs helped pass the time as we waited. It was late – a Hereford trained passed under the bridge & I was expecting the 31 to be held at Droitwich for it, but in the distance I heard the noise of a diesel loco, it was the 31, soon the yellow of the DBSO appeared in the distance with the loco propelling. It was booked to stop in the loop, but did not slow down and went speeding by towards the Lickey Incline. Task completed, head home for lunch, then Shrewsbury in the afternoon to see 76079, but you already know about that – it was in the previous update. One photo here, you’ll have to click the link to see what the others are! 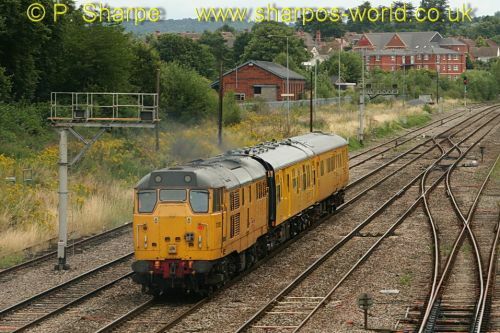 This entry was posted in "Mostly Midlands" gallery on July 26, 2009 by Sharpo. 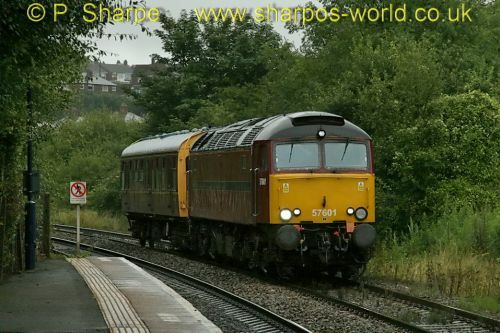 Friday 24th July and I was heading to Shrewsbury for the WCRC ecs working to Machynlleth. 76079 was hauling the train from Crewe, with 33207 on the rear. During the summer, 76079 will be working “The Cambrian” and this move was in readiness for the first run on 27th July. This entry was posted in Sharpo's World Photo Updates on July 26, 2009 by Sharpo. KC didn’t have her walk along the river today, as it had been raining, so straight up to the station. A train was due within minutes so a slight delay in buying our sandwiches. 42968 tender first with the Venturer diner heading for Kidderminster – then time for lunch. Next trains to cross were 7812 northbound & 46443 southbound without stopping – either a charter or footplate experience. The other 2 we saw were 4566 on the Limited diner, crossing with 7802 on a train to Kidderminster. 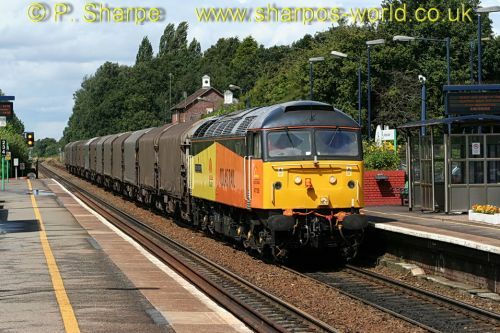 This entry was posted in Severn Valley Railway on July 26, 2009 by Sharpo. 5 locos seen running today around Arley. 42968, 7812, 46443 on Footplate Experience, D1062 on diesel turn & 7802. Nice sunny day as well. 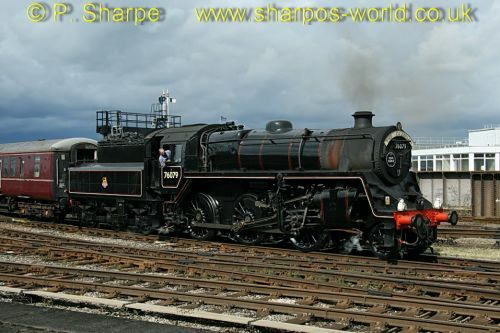 This entry was posted in Severn Valley Railway on July 25, 2009 by Sharpo.